Women aren't often mention in connection with the Pony Express. There's no record of a woman ever taking part as a rider, but that doesn't mean women didn't play an important role. After all, someone had to feed those riders and station keepers and the gaggle of other males working as wranglers and blacksmiths and superintendents. But women are often mentioned only in passing as the "wife of" (or as "wives" in the case of stations located in proximity to Salt Lake City, Utah). "A woman on Plum Creek in Nebraska Territory started a store across from a Pony Express station. She baked as many as 100 pounds of flour a day, sold bread at 50 cents a loaf and made as much as thirty dollars per day. She made cheese which she sold at 25 cents a pound and travelers paid as much as $2 for the good meals she prepared." It wasn't until years later when I visited the Dawson County, Nebraska museum in Lexington, Nebraska, that I learned that woman's name. Louisa Freeman's blue cupboard is on display at the museum. I was thrilled to finally "meet" the woman who worked harder than I can imagine. I wonder if she even had time to see the Pony Express riders flash by! Mrs. Tom Perry of Kennekuk Station, a fine enough cook to receive praise in print from none other than Mark Twain (he mentioned her excellent coffee). Seneca Station was actually located at a two-story hotel. According to historian Joseph di Certo, "Pony riders enjoyed this home station not only for its comfortable accommodations, but also because Mrs. Smith was an excellent cook." An immigrant from French-speaking Alsatia owned the ranch in Marshall County where one traveler remarked on ham and eggs, hot rolls and coffee, served "fresh and good." Sophia Brockemeyer Hollenberg (pictured at right) and her husband, Gerat, founded Hollenberg Station (operated as a historic site by the Kansas State Historical Society). 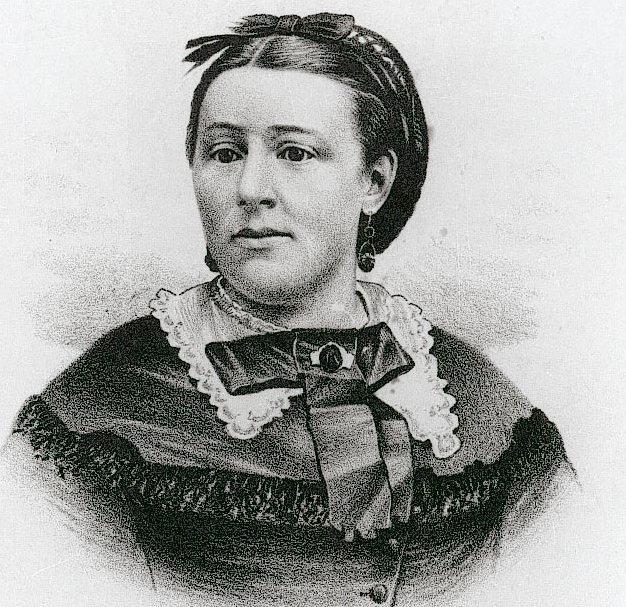 Molly Slade and her children lived at Horseshoe station where the station keeper (her husband) was not only a division superintendent for the Pony Express but also a notorious gunslinger. Three Crossings (home station to a young rider named William F. Cody) was kept by a Mormon couple named Moore, who'd stopped there instead of going on to Salt Lake City in Utah "upon learning that the men in Salt Lake City had more than one wife." Mrs. Moore is remembered as an "excellent cook and a spotless housekeeper." An English couple ran Little Sandy station. At Ham's Fork Station a Scot was the keeper--along with his two wives. Muddy Creek Station was operated by "a French Canadian and his wife." In 1776, Abigail Adams famously encouraged her husband to "remember the ladies." What women from history do you think deserve more attention? Tell us in a comment below (no later than Friday, April 15, 2016) and your name will be entered in the Saturday, April 16, 2016 drawing to win a free copy of Stephanie's tribute to the women of the Pony Express, Messenger by Moonlight, releasing in May. I think that the brave women who ran businesses and ranches on their own after losing a spouse are great women to highlight in history. What courage that took in a time when it was frowned upon. I am adding Messenger by Moonlight to my TBR list. Thanks for the giveaway! I certainly agree about women who ran businesses and ranches. We have a historic site in the western part of Nebraska that was taken over by the wife after her husband passed away and I remember being fascinated by her life. I think it would be interesting to read stories about how in some cases, the women were the ones actually running a business that was fronted by their husbands, fathers or brothers. As a fan of Mercy Streeet on PBS, I would love to know more about the women who served as nurses during the Civil War era. OH, I think the nurses working on the battle fields during the wars would be so interesting as well as women doctors back when as they were far and few between. I love reading stories about the pioneer women, but any woman who blazed a trail into new territory has an interesting story that should be told. Maybe it would be good to hear more about women who were part of settling the early cities. I like that idea. Early townspeople. I have enjoyed each and every one of your books since first discovering them. I'd like a ok that started just a bit earlier and followed a woman or family from her home in Germany. Thank you, Jodi. The ocean crossing would have terrified me. I remember watching a film called The Immigrants years ago and thinking, "I couldn't have done that." I wish we knew more about the lives of the Native American women. None of the pioneering women had an easy life, but we know very little about their lives. The other era would be the lives of women during WWII and personally, I would love to follow the lives of the women that lived and worked near the training bases in Nebraska. You might enjoying reading a biography called Bright Eyes about a Lakota woman. The La Flesche sisters were incredible women. The women here in the US who worked in the factories, etc. during WWII intrigue me ... the training bases in NE would be a good place to set a novel. Wow, very cool info! I love reading history and finding hidden gems of women in jobs or places of importance. I cannot imagine baking 100 pounds of bread in one day, though. About that 100 pounds ... I have very often wondered if that is an example of oral history exaggerating just a bit. I love reading about (and would love more of them) the women who traveled west in wagon trains. Their reasons for going fascinate me, as well as the experience of the journey. I am especially drawn to the women went because it was their husband's dream. I've even read some accounts of the journey basically being the couple's "honeymoon" trip. Brittany, the University of Nebraska issued a series of books called Covered Wagon Women that publishes the women's actual letters written while traveling west on the Oregon Trail. The volumes go chronologically through the era when folks were heading west. I bet you'd love reading those letters. Your library probably has access to them. There are a couple of books by historian L. Schlissel that are about those women, too. I can't remember the titles but I remember loving those books. I would love to see a story the looked at the Pastor's wife or the doctor's wife. I have such respect for both in today's society, I can't imagine what it would have been like back then. Great idea! There is a novel out that was inspired by John BUnyan's wife ... Jody Hedlund was the author ... and I read and loved it but I can't think of the title! I have always admired the women who were willing to leave their homes, and their family, to follow their husbands into unsettled territories and unknown dangers. At the risk of telling my age, I loved watching Wagon Trail when I was small and I always thought that the women were the brave ones. They gave birth while on the journey, they fought to keep their children safe and well and if a child died they had to bury them and then move on. I loved Wagon Train, too ... and Gunsmoke ... and Bonanza ... and the Big Valley ... and I think you are so right about the courage those women had to have in the West. Always an interesting piece of history to be learned on this site! The Pony Express isn't something you hear too much about. Thank you for the chance to win a copy of "Messenger by Moonlight", it sounds like a good book! I believe Tracey Peterson did a series featuring the Harvey Girls ... don't know titles, but you might look for it! There are lots of strong women to spotlight. Thank you for this fascinating post. Thanks for taking time for it, CAryl. Good old Plum Creek Lexington's first name). That's where I set my novel Sixteen Brides. I love the history of that part of Nebraska!